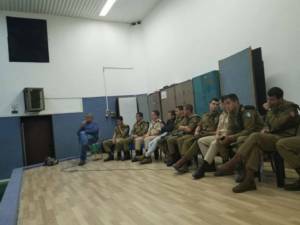 Idit the youth instructor, Tav the Engineering Corps officer, Kol the officer from the special unit, Omri the paratroopers’ commander, as well as A. 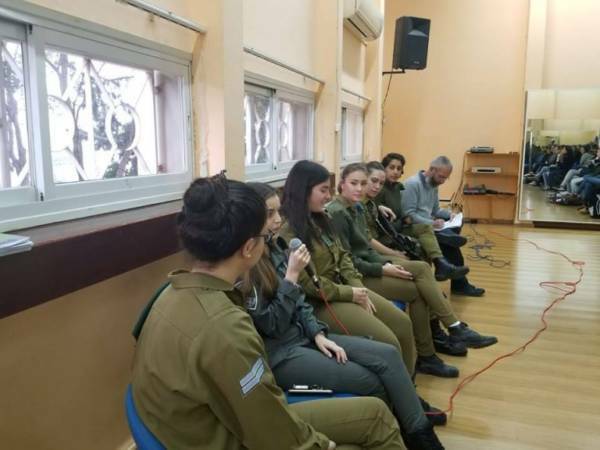 (full name withheld) the pilot – all graduates of Sci Tech Psagot school in Karmiel – came to their old school for an emotional meeting with the educational staff who’d accompanied them during their school days. The graduates, now attired in IDF uniforms, were received in the staff room – which had been off limits for them until not so long ago – with emotional hugs. The graduate-soldiers met with the school’s 11th and 12th grade students, and each one of them gave an account of his or her course of service, from basic training through to more advanced phases. The officers in the bunch motivated the students to take on a career as an officer; Idit, who’d recently finished a year of pre-military voluntary service to society, recounted her basic training and how she became a youth instructor in the Youth Corps (GADNA); the female soldiers reassured the girl students: “don’t worry, everybody finds it hard at the beginning, but afterwards it’s fun…”; Gal told the boys about the navy; And Koren described the challenges of the squad commanders’ course which he finished just recently. A. (full name withheld), one of the three pilots among the school’s fourth year of graduates, told the students about the different stages of the IAF’s flight course, and encouraged the girls to try and apply to the course as well. “Men have no advantage over women as pilots, and sometimes it’s actually the opposite,” he told the girls he conversed with. Later on, the pupils asked the graduates some questions, consulted them about their military prospects, received some advice and plenty of information, and asked for “tips” about getting to serve in elite units. This event, called “Graduates Reporting from the Field”, is an ongoing tradition in this school, highly anticipated by soldiers and students alike. There’s no doubt that this event, along with other school activities aimed to prepare the students for their military service, is getting results in the form of very high draft percentage among Sci Tech Psagot students: 98% for boys, and 96% for girls, as of this past year.